This stunning rental villa is situated just a short distance from Elia Beach, and close to the traditional village of Ano Mera (3 kms away). 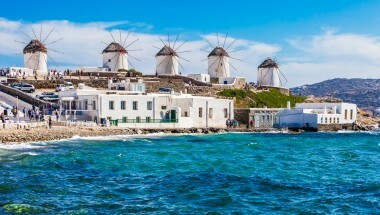 Mykonos town is 10 kms. 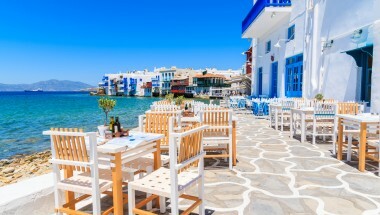 Its hillside position, and large terraces, allow for magnificent views to the Aegean Sea, as far as the islands of Paros and Naxos. The architecture of the villa is typically Cycladic, in a white ‘cubic’ style which integrates perfectly into the rough Mykonian landscape. The rooms open up to the terraces furnished for outdoor living, and dining, with shaded pergolas and a barbecue. To the front of the villa is a large swimming pool with over-flow effect. There is also a small shaded playground with various toys for children up to the age of 8 years. The interior (175m2) combines a minimalist style with a comfortortable and tranquil ambience. The accommodation is on two levels with the entrance level having the large living room, with dining area and the modern fully equipped kitchen, all opening up to a large dining terrace with pergola. The lower level has the master bedroom, as well as another double bedroom and a twin bedroom. There is also an additional single bedroom (without windows), and a sofa-bed in the living room, so the villa can easily accommodate 6 – 9 people in total. Amenities include a central cooling module, flat-screen satellite TVs and Wi-Fi internet. There are safe boxes in all bedrooms and hair dryers in all bathrooms. There is also a baby cot available for infants up to 2 years old, and parking for up to two cars. Large living room with cosy dining area. Modern and fully equipped kitchen with dishwasher, washing machine and dryer. Bathroom. Daily maid service included. Change of linen and towels every two days. This luxurious rental villa is situated just a short distance from Elia Beach, and 3 kms from the traditional village of Ano Mera. 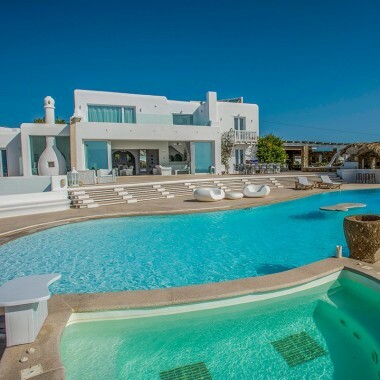 Mykonos town is 10 kms away. 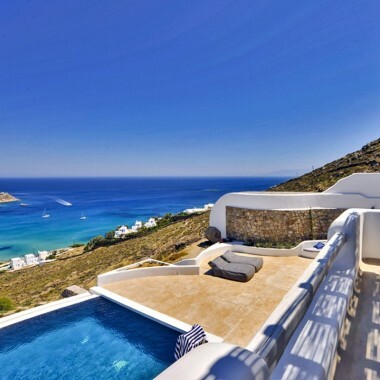 From its hillside position, there are magnificent views to the Aegean Sea, as far as the islands of Paros and Naxos.